I was asked the other day about my signature style and what the most important aspect of my wardrobe was, to which I answered accessories and shoes. I truly believe that both can change the entire look of an outfit in a relatively inexpensive way. 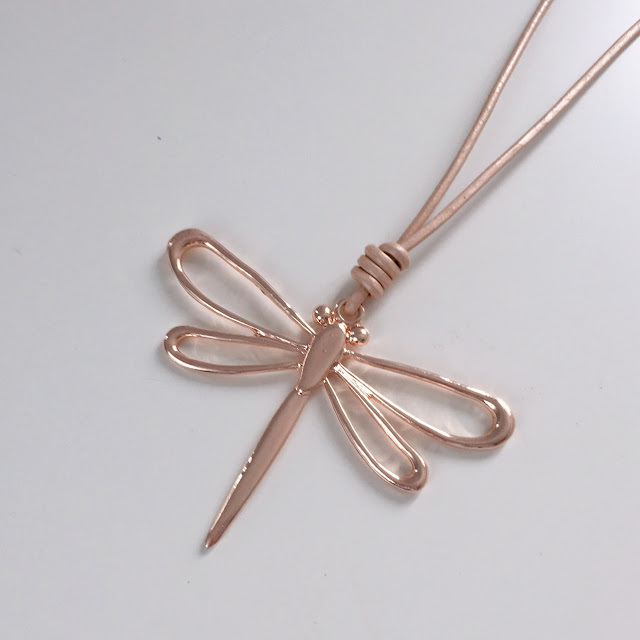 I’m sure my answer comes as no surprise, after all, I have my own jewellery and accessories website and this week I’ve added a lot of new summer pieces. It was scarves that I started my little business with just over two years ago and I’m always amazed by how many women have twenty, thirty or more. I have lovely repeat customers who see scarves as being practical all year round as well as being the perfect way of adding a pop of colour or pattern around the face. It goes without saying that scarves are their most useful during autumn and winter, but I wear mine regularly throughout spring and summer. I find they are an excellent way of protecting the delicate skin on the neck and chest from the sun, they add a layer when the mornings are on the chilly side and they are also great for sitting outside in the evenings because here in the UK it is very rare indeed that we can sit al-fresco sans woollies once the barbeque is over. They act as a barrier between midges and mosquitoes and our skin and they can also be used as a small sarong or beach cover-up in hotter climes. Scarves are also an excellent way of dipping a toe into a seasonal trend. For example, one only needs to look at Instagram to see that pineapples are everywhere. 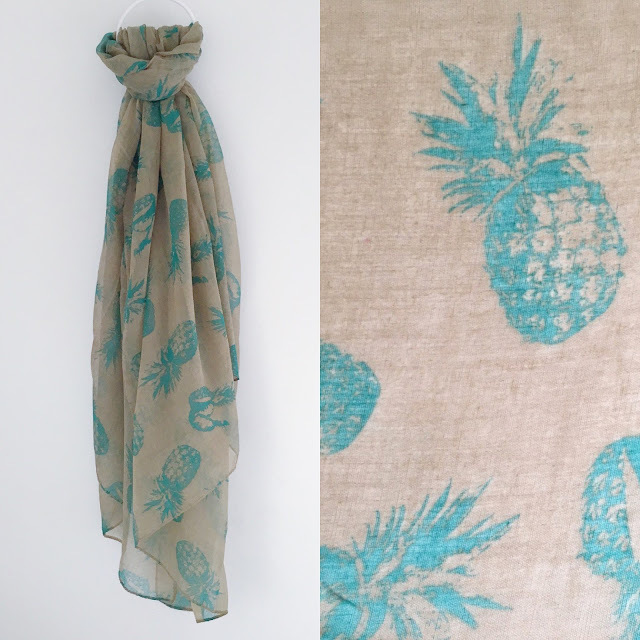 Available in beige and black and light khaki with turquoise they inject a bit of fruity fun into an outfit. These birds of paradise are lovely adding pretty colour and detail. 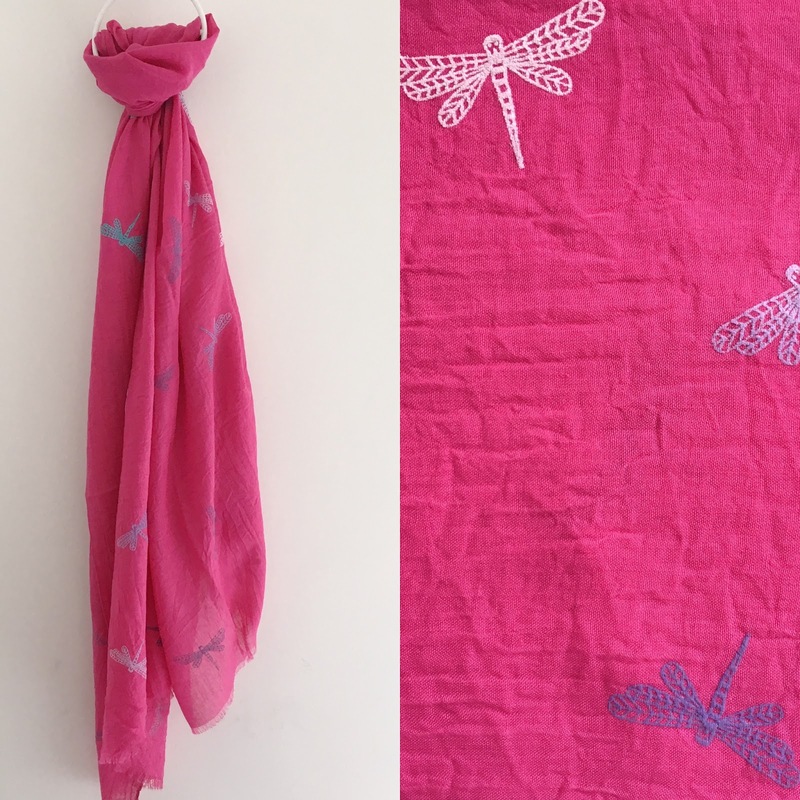 Dragonflies are among my favourite things so I couldn’t resist these scarves which come in sky blue and hot pink, each with little scattered dragonflies in different colours. These dragonflies are textured, (I’m trying to think of how best to describe them, They’re not embroidered, nor are they printed but they are raised from the fabric of the scarf). And keeping with the dragonflies, these large statement pendants are a very versatile piece of jewellery and are available in rose-gold and in silver. I wore mine with my LBD last week. These buckle wrap bracelets have proved popular in silver grey and rose-gold (I’m wearing the rose-gold one in the photograph above), so I added a versatile black to the collection. They are super sparkly and are very elegant and neat and are a lightweight way to add a lot of shine. And finally, two vibrant wrap bracelet designs in turquoise and in hot pink. Fabulous on the beach and layered for festivals and parties. These both wrap round the wrist twice and fasten with a press-stud. The scarves and wrap bracelets are £12.50 and the pendants are £15, but for the duration of Euro 2016, I am offering a 10% discount with the code “footballwidow”. All payments are facilitated by Paypal but payment is also accepted from all major credit and debit cards, but it’s not very on the website though when going through the payment steps. For card payments, the option of “creating an account” or “checking out as a guest” must be selected. It will still look like it’s Paypal, but all relevant card details can then be entered. I post everything first class and almost always within two days of receipt of the order. The Lizzy O jewellery comes in an organza gift bag. The scarves come wrapped in bright pink tissue paper. The “footballwidow” 10% discount code is also valid on my Danon jewellery range. Depending on stock levels, these items may take a little longer to be delivered because if they aren’t in stock, they’re ordered from Israel, where they’re handcrafted. If you’re celebrating Father’s Day today, have a wonderful day. My parents will be spending the afternoon with us. My dad is the man above all men and is a rock for me and my children and is the is epitome of kindness, gentleness and loyalty and we absolutely adore him. 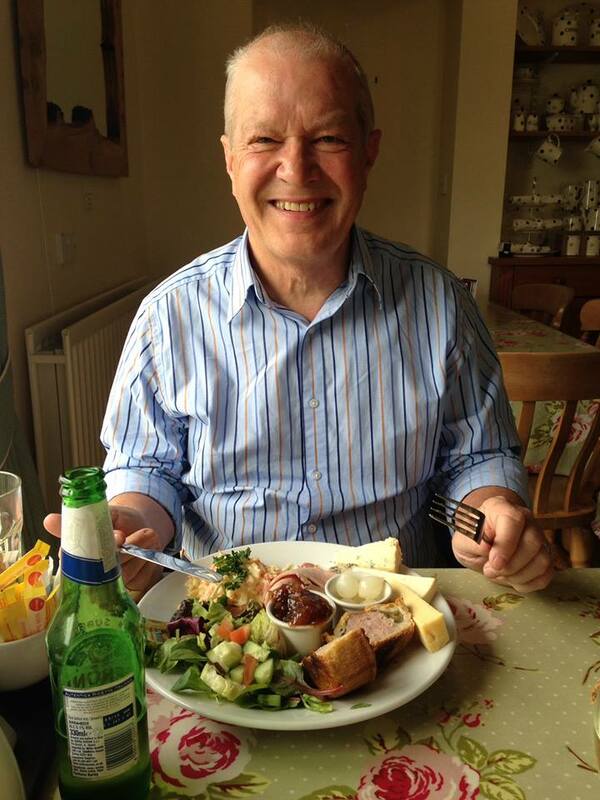 This was taken last year when he was my lunch date for a food review I did for work. I love you dad. Previous Post A Pink Poncho, A Flamingo Top and Some Rules For Parenting Teens. I love scarves too but its too hot to wear them here in the Algarve in the summer, which is a pain because I love them!! I'm always wearing them in the winter and yes, I have SO many. It drives my husband nuts if I come home with a new one lol! I love scarves too, I wear them all year round.Love how they tie an outfit together, and I'm still getting use out of mine just now as the weather is so rubbish! These scarves are all so pretty; I can't decide which one I like best! The dandelion ones and the dragonfly ones are really special. And the birds; that print is so charming.